Let’s just acknowledge the elephant in the room right now. I am what you call a chronic dieter. Every time a new fad comes out, I’m one of the first to jump on the bandwagon. Trying new systems has been a way of life since I was 10 years old. There was a point in my adult life when I gave up the word diet, but still cut out certain foods to be healthier. When I was pregnant with my fourth child, bad acid-reflux forced me to give up gluten. It turns out that I have a strong aversion to conventional American made products with wheat. I’m not sure if it’s the herbicides on the plants or the plant itself but it wreaks havoc on my digestive system. During this time, I became more aware of the foods I was eating; buying organic and non-gmo foods to feed my family. I gave into sweets and some junk food because it was gluten free, which kept the weight on. Even though, I ate a diet of mostly meat and veggies, I never counted calories or was strict about the amounts of food I consumed. By not eating refined carbs, I thought I was doing okay, but my pants didn’t agree with me. In my head, I was doing everything right but wasn’t losing the weight I wanted. Then one day I came across an article that mentioned Darya Pino Rose’s approach to eating in her book called Foodist: Using Real Food and Science To Lose Weight Without Dieting. Like me, Darya Rose was a chronic dieter until she began focusing on the science and nutrition behind food. As a neuroscientist, she is constantly researching the fundamentals of science through her love of food. I’ve read so many “diet” books, so I figured I’d give this one a shot. As someone who consistently thinks about what I eat, worried that I will gain a few pounds by looking at a bowl of pasta, I was intrigued by her ideas. The premise of the book is about eating mindfully. Interesting, but what does that really mean? In the simplest form, it’s slowing down and enjoying the foods you eat. Mindful eating is being aware of the food you eat and taking time to enjoy your meal without distraction. When we are shoveling food into our mouths on the go, we make eating a subconscious activity, not the main attraction. That’s when the light bulb went off. I eat until my plate is clean, never realizing if I am actually full before my food is gone. Sometimes I get seconds because it tastes so good, but don’t think about what I feel like afterwards. 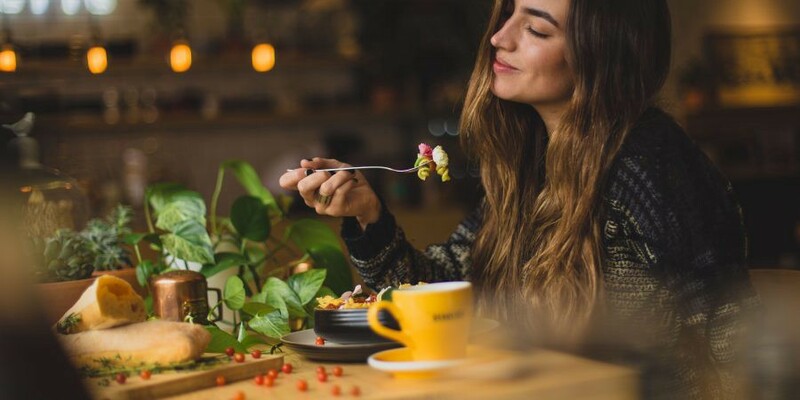 Mindful Eating, Does It Work? After years of feeling gross after meals, I knew I could do something different. What didn’t dawn on me on a conscious level was to stop and enjoy my food. It’s been a week since I decided to take her tactics for a test run and it’s been eye-opening. The goal was to feel better, make wiser food decisions and as a side result lose some weight. As someone who ditched the scale, I’m not sure if I’ve lost any weight, but I noticed my belly is less inflamed when I wake up in the morning. The only change I made to my daily diet was making the intention to slow down. I sit down to each meal, savoring every morsel, chewing my food completely and setting down my fork in between bites. It seems daunting to do this, but it allows me to truly enjoy the food I’m eating. I stop eating foods that once might have tasted good when being shoved into my mouth at lightening speed but are no longer are appetizing. The choices I make for my meals are thoughtful because I want to make sure it is something I want to eat. By setting my fork down, it slows everything down and I have been eating at least 50% less than I normally did. I also start out by giving myself a smaller portion and drinking a lot of water during the meal. I find myself getting fuller faster but still enjoying foods I love without having to give anything up. That’s a phrase I’ve been saying to everyone for years when I gave up the word diet. But that had more to do with the food I was eating, and not how I was eating it. Once I started tracking my food to see what I eat, when and how I felt, I realized I mindlessly munch on snacks. My portion sizes have diminished immensely and I even did the unthinkable at a restaurant: I didn’t finish my food. Restaurants meals could feed two or three people, but most of us eat whatever is put in front of us. When we went out, I slowed down, enjoying time with my family more than the food I ate. Since I only ate a third of the food I order, I felt great on the way home. Although, the food was more decadent, it didn’t matter because I didn’t eat it all. Being able to slow down is not easy in our society. Everything is telling us to hurry up and do more. When we take the time to do one task, we embrace mindfulness in all areas of our life. When I began reading this book, I was skeptical because nothing has truly worked for me over the years. Sure, I’ve had my moments when I’ve figured out a plan, but then go back to my old ways. There is nothing in this method that forces you to eat a certain food or give up what you love. By default, you choose healthier options when listening to your body and enjoying the food you are serving yourself. Mindful eating might take conscious effort but in the end it’s the best thing I could do for my health.